Oh, how I would love to travel the world and sample desserts from various countries. I enjoyed reading this sponsored post about the delectable desserts from Cyprus and wanted to share it with you. Have you tried these desserts? I've had kourabiedes and they were delish. It was fun looking up each. Enjoy! The island of Cyprus is known for many things, not the least of which is their impressive range of delicacies, both savoury and sweet. While traditional Cypriot food takes from some of the most delicious culinary cultures in the world (Turkish and Greek) the local fare has a flavour all its own. For visitors who packed a sweet tooth, Cypriot treats are some of the most interesting and delicious sweets your tastebuds will ever know. Here's a simple guide for those flying out the Cyprus with First Choice and wanting to navigate its delicious world of authentic desserts. These are essentially tiny, sweet, fried doughballs covered in syrup or honey. They are incredibly delicious and dangerously addictive. A local favourite at fairs and festivals throughout Cyprus; the dessert is made by dipping strings of nuts in hot grape juice, which then solidifies and creates a sort of candy coating. This treat is both delicious and fun to eat. This dessert is a preserve which can come in a range of flavours including dates, almonds, apricots, cherries, quince or grape. These preserves are traditionally served with a glass of cold water. These are traditional Cypriot almond cakes which are coated in icing sugar. A favourite among tourists, they are abundantly available and truly delectable. This is the famous dessert otherwise known as Turkish delight. The sweets are a family of confections which can be simple gels of starch and sugar with some of the more premium varieties including other ingredients like chopped dates, pistachios and hazelnuts that set within the gel. Eaten in small cubes and dusted with icing sugar, if there's one dessert every visitor must try, it's Loukoumi. If you're lucky enough to be visiting Cyprus over the New Year, be sure to try this traditional New Year’s cake. There's a gold coin baked into each of these cakes and it is said that the slice with the coin in it will bring good luck for the duration of the year! There are few more simple and delicious desserts in Cyprus than the bountiful fresh fruit. Local fruits include watermelon, oranges, strawberries, grapefruit, tangerines, melons, apples, pears, prickly pears, cherries, apricots, figs, pomegranates, bananas, plums, grapes and dates. More often than not these delicious fruits are fresher than fresh, typically being picked from a nearby tree and served as they're ordered. There's nothing quite like savouring the fresh flavours of seasonal Cypriot fruits; it is truly the ultimate dessert. Cypriot fare is absolutely incredible. From the Greek and Turkish influences, to the fresh flavours cultivated in local fields and kitchens, the cuisine is to die for and the sweets are no exception. Whether they're enjoyed at the end of a meal or as a standalone treat, everything from traditional candied nuts to Turkish delight to fresh figs straight from the tree; Cypriots know how to bring sweetness to life in all sorts of delicious ways. Image by Ale, used under the Creative Commons license. Haha, man, that sounds awesome! I wish I could sample all the world's cuisines. I feel like we miss so much when we stay within our own country. Those sweets look so interesting!!! I can actually send your a pack of most of these. There are the same with our Greek ones and even have exactly the same! I love this post, now I am going to make loukoumades!! Oh these sound so nice! Other than fresh fruit (obviously!) I haven't had any of these desserts though! Is good to travel and try out what they have to offer in sweets or food these look delicious. Have a lovely weekend. Yummy! I would like to try those loukomades. I wish to visit Cyprus and Turkey too. I must admit I've never had Cypriot dessert EVER! I'm missing out! That Loukoumades sounds delish! It reminds me of that Indian dessert Gulab Jamun. thanks for sharing these traditional desserts, Kim! Oh Kim, this post made my mouth water! Desserts from this part of the world are my absolute favourite, particularly Turkish delight, although I admit I've never had anything specifically from Cyprus. I may just have to change that! Those look delicious. I wonder if they're the same as turkish delights? I've had those once when one of my neighbors brought some over. They're really good. I'd love to visit Cyprus someday, sounds so exciting. I have tried these desserts before, well not the same ones but similar. A colleague bought some during her visit to Cyprus and gave to us. It was way too sweet for me though, but lots of my other colleagues loved it. I would love to do a cruise around the Mediterranean sometime and Cyprus would be on my list for sure! I want to try them all too!! I love trying out new things, especially sweets! This post made me droll, I never visit Cyprus, only Corfu. I don't think I've ever experienced desserts from Cyprus before. These all sound so good especially the Kourabiedes. Hola Kim, Well I think I'm ignorant but I had to google Cyprus. I don't know why I actually thought it was related to Egypt! What a lot of new knowledge about these sweet treats. I'm not so much of a sweet person but I always enjoy learning new things. I love the decoration in your previous post. SO magical. Happy Thanksgiving (belated)! I wish to play that glass elevator slots so much coz I haven't experienced one whose seat shakes. Must be really fun even if they don't pay well. I do play slots on FB at times and I think it's quite fun. they all look great and I think I even tried some of them- at least a very similar version! So many goodies to try! I love tasting things from all over the world. It is really inspiring for ideas in the kitchen. Oh these all sound amazing and I have had Loukoumades and they are amazing. 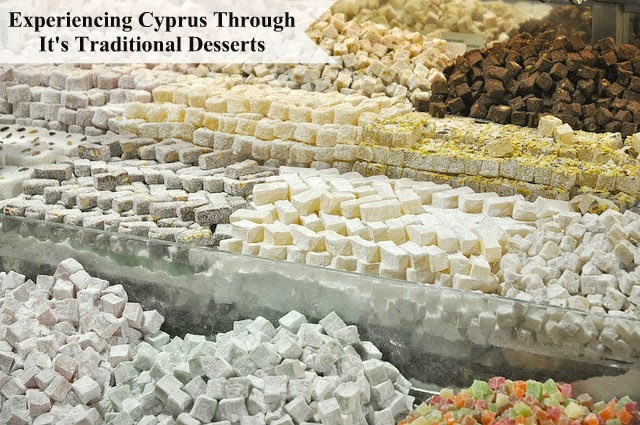 I don't really know anything about Cyprus, but it's interesting to read the descriptions as some of the desserts sound really familiar to me because they're popular in surrounding areas. I love trying new deserts or any food for that matter whenever I am abroad. Yummy desserts. I would not know where to start and which one to pick. So many different desserts to try! Great post! I need to visit Cyprus soon. Loukoumi (lokum) is very popular in my country too. If I happen to visit USA soon, I'll bring you some! Great Guest post! I have never tried any of these. They have a simple look t to them, but sound amazing!The kourabiedes sound amazing! i want to try whatever is in that photo!! Yum yum yum! This post is perfect for your sweet blog. Hihi. oh i love these desserts, anything from that part of the world actually. especially kourabiedes - i ate so much of that in greece! Oh my yumminess, I'm in love with Turkish candies that are covered in icing sugar but I don't remember their name! I've never tried any of these. I feel so unworldly! I've been quite lucky and have tasted many of these.